Trump supporters attend a rally in Portland earlier this month. Nearly five months into his presidency, President Trump’s voters, even the most skeptical ones, are sticking with the president. In April, I first wrote about a group of Trump voters whose hearts the president had not won, but who had helped him win the election all the same. We call them reluctant Trump voters. The group is white and older, like most Trump voters, but the reluctant Trump voters are less likely to identify as Republican and have a higher level of education than the president’s base of most-enthusiastic supporters. Reluctant Trumpers are a key group to watch in the next year as the midterms approach, and we wanted to check in on them periodically. Partnering with SurveyMonkey, we conducted a survey over the last days of May and into the first days of June, to see how reluctant Trumpers were feeling about the presidency during a rather active period in Washington. Since April, the health care bill passed the House, and the Russia investigation has swelled in prominence, with the firing of the FBI director, the appointment of a special counsel and new attention on Jared Kushner’s back-channel meetings with Russian officials. For now, reluctant Trumpers are mostly sitting tight on their support for the president. It’s certainly a more tepid variety of support than the president’s other voters, but all in all, the topsy-turvy time in the capital hasn’t moved people too much from where they were earlier this spring. Seventy-four percent of reluctant Trump voters approve of the president’s performance overall; that’s right where the number was in April. By comparison, 96 percent of the president’s more enthused base approve of the job he’s doing, which also shows no significant change. But this group is also more approving of the appointment of Robert Mueller as special counsel to look into the campaign’s Russia collusion allegations; 54 percent of reluctant Trump voters approved of the move, while only 38 percent of other Trump voters approved. The reluctant Trumpers were also more turned off by the firing of James Comey as FBI director than other Trump voters. Sixty-three percent of reluctant Trump voters still approved of the move, but that’s compared with the 91 percent of other Trump voters who stood behind Trump’s firing. Comey, who will testify before Congress on Thursday, remains central to the unspooling affair d’Russe. Something to watch over the next few months: how Reluctant Trumpers feel about accusations that Trump attempted to obstruct justice when he reportedly asked Comey to halt his investigation into former national security advisor Michael Flynn. 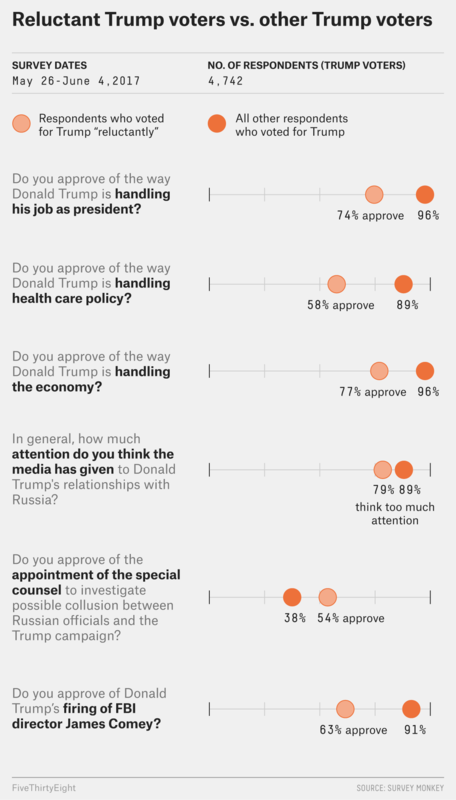 Right now on the question of impeachment, neither reluctant Trump voters (87 percent) nor strong supporters (96 percent) think the president has committed an impeachable offense. But there were some surprises in the survey. While the panel results mostly showed that the Trump voters, reluctant or not, are holding steady in their support for the 6-month old presidency, the reluctant Trumpers departed from the pack on one fascinating point. Respondents were asked, “If you had to choose one of these Republicans to serve as president, who would it be?” and given the choice between Donald Trump, Mike Pence and John Kasich. Seventy-seven percent of Trump’s core voters said they would vote for the president again, but the reluctant Trumpers answered much differently; only 26 percent said they would vote for Donald Trump. Thirty percent chose Mike Pence.